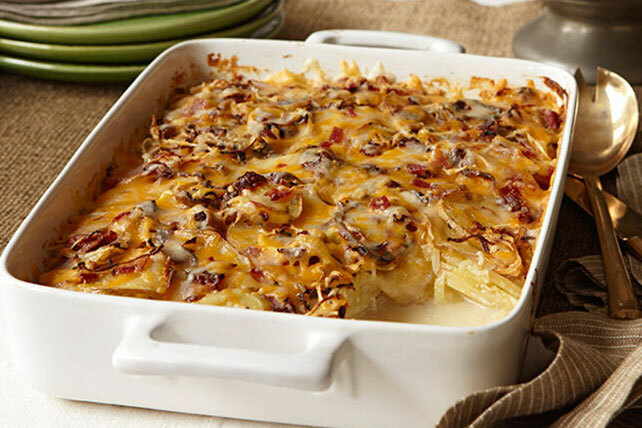 Steal the show with our Simple Scalloped Potatoes! This Simple Scalloped Potatoes recipe features a creamy, cheesy sauce and heavenly bits of smoky bacon. Cook first 3 ingredients in saucepan on medium heat until cream cheese spread is melted and mixture comes to boil, stirring constantly with whisk. Reserve 2 Tbsp. bacon. Layer half each of the potatoes, onions and remaining bacon in 13x9-inch baking dish sprayed with cooking spray; repeat layers. Add cream cheese sauce; cover. Bake 1-1/2 hours or until potatoes are tender and top is golden brown, uncovering and topping with shredded cheese and reserved bacon for the last 10 min. Substitute 1 pkg. (8 oz.) PHILADELPHIA Cream Cheese, cubed, for the cream cheese spread.